I've been very slack at posting on here. I put little snippets of information on my Facebook page often so perhaps I can be excused. This week is half term and was of course, Valentine's Day. 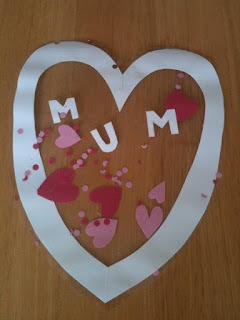 Our activities have been based around heart shapes and red/pink colours. We made some heart shaped decorations. The older children were able to do their own while the younger ones needed help to cut out shapes. These were then arranged inside a laminator pouch. The one above was made by a fourteen month old. He had great fun playing peek-a-boo with it afterwards! 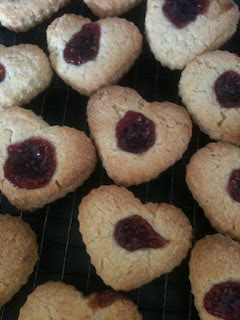 Jammy biscuits, the recipe for these was posted earlier in the blog. Rather than roll the dough into a sausage/slice into biscuits, we rolled it out and used a heart shaped cutter. They were delicious.